I custom designed and built this black walnut dining table for my client based on his specifications and a design of a similar table he liked. The table features a 1 3/4" thick solid black walnut top with breadboard ends. The aprons are a full 1 1/4" thick to keep the top nice and flat and the solid 3" tapered legs are connected to them using hefty mortise and tenon joinery. This piece is hand finished in multiple layers of oil polyurethane to highlight the figure of the wood and provide maximum protection. If you are interested in this piece or something like it, feel free to contact me, and I would be happy to provide you with a price quote and discuss the many custom options available. 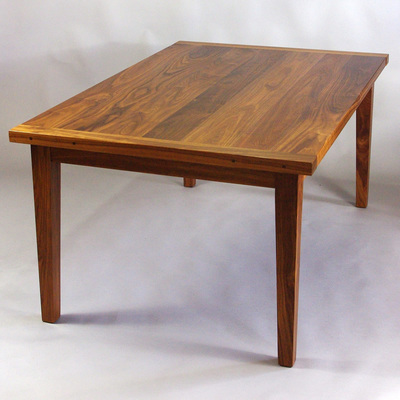 Since 2006, Aaron Maes has created handcrafted, custom furniture with integrity and uncompromising quality as Rugged Cross Fine Art Woodworking. 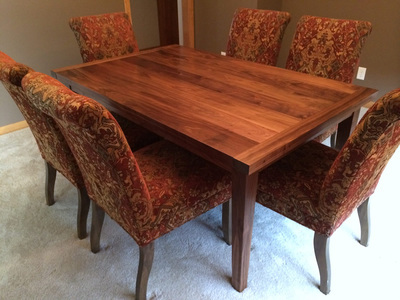 Aaron enjoys the challenge of custom designing any piece, and has built several extraordinary chairs, tables, desks, chests, benches, cabinets, doors, dining room and bedroom furniture pieces over the years. Rugged Cross Fine Art Woodworking is located in Arena, Wisconsin but Aaron delivers his pieces by hand or by carefully custom crating items for shipping to anywhere in the country.